Background and objectives: Both larger molecule removal and dialyzer biocompatibility have been implicated in the high-flux hemodialysis (HD)-associated favorable outcome. In an attempt to delineate the effect of membrane permeability, we performed a randomized, crossover study to compare the inflammatory biomarkers, lipid profile, and aortic pulse wave velocity (PWV) of two dialyzers that are composed of identical membranes but with different flux characteristics. 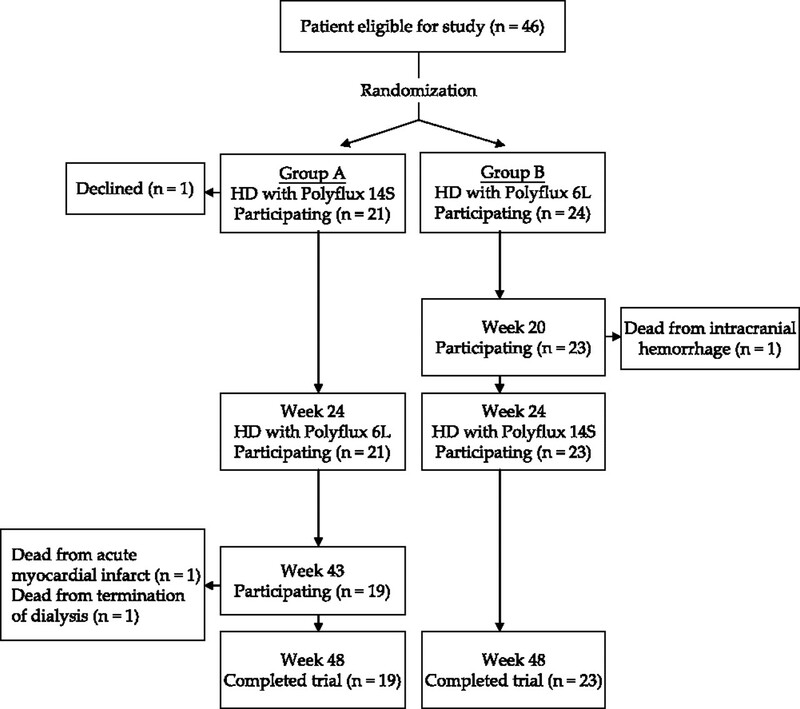 Design, setting, participants, & measurements: Stable patients who had anuria and were on low-flux polysulfone membrane were randomly allocated either to HD with high-flux polyamide membrane (group A; 22 patients) or to HD with low-flux polyamide membrane (group B; 24 patients) for 24 weeks, then they were started on 24 weeks of the alternative HD treatment. Apart from the dialyzer, the dialysis prescription remained unchanged. Results: Nineteen patients from group A and 23 patients from group B completed the study. 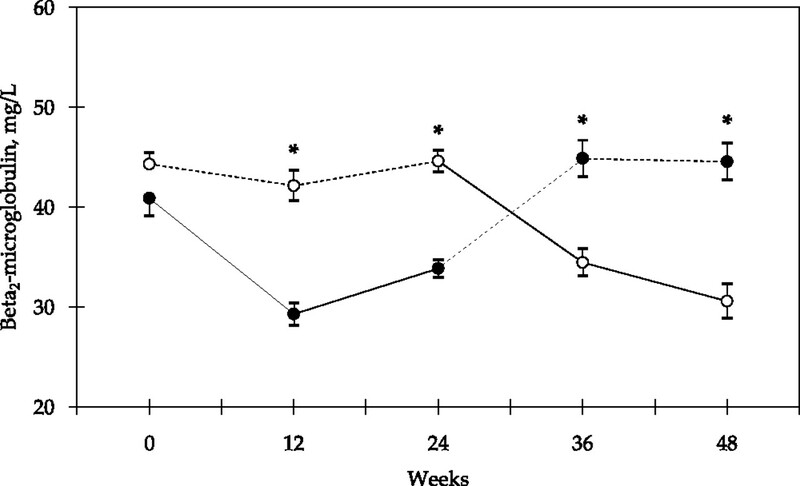 Predialysis β2-microglobulin levels decreased significantly when using the high-flux polyamide membrane. No difference between membranes was observed for serum albumin, high-sensitivity C-reactive protein, fibrinogen, IL-6, triglycerides, HDL cholesterol, LDL cholesterol, and lipoprotein(a) during the study. A significant increase in aortic PWV, a marker of aortic stiffness, was noted after patients switched from high-flux to low-flux polyamide membranes. Similarly, the rate of change in aortic PWV was significantly decreased with the use of the high-flux polyamide membrane. Conclusions: Our findings suggest that dialysis with polyamide membranes with different flux characteristics did not modify the inflammatory indices and lipid profile in stable HD patients; however, a seemingly beneficial effect on aortic stiffness was noted for patients who were maintained on high-flux polyamide membrane. Atherosclerotic cardiovascular disease is the leading cause of death in hemodialysis (HD) patients. Risk factors, such as inflammation, dyslipidemia, and oxidative stress, may contribute to the accelerated atherosclerosis seen in these patients. Some of these factors are potentially modifiable. Compared with HD with low-flux cellulosic membrane, HD with high-flux synthetic membranes has been shown to attenuate hyperlipidemia with significant reduction in triglyceride and increase in HDL and lipoprotein lipase activity (1,2). A similar favorable finding has also been reported for C-reactive protein (CRP) with the use of the high-flux synthetic membrane (3). The Hemodialysis (HEMO) Study, the largest published randomized trial of long-term HD patients, also suggested that high-flux dialysis might reduce risks for specific cardiac-related events among patients with >3.7 years of dialysis (4). The better cardiac outcome is thought to result from removal of larger molecules with the use of high-flux membranes. These membranes, however, are predominantly manufactured of synthetic materials that are at the same time more biocompatible. It is difficult to discern between the impact of larger molecule removal and that of dialyzer biocompatibility on HD-related morbidity and mortality. It may explain the absence of favorable effects on dyslipidemia and inflammatory markers (CRP and IL-6) in other randomized trials (5–7) that compared membranes with different permeability but with similar biocompatibility. With the advance of technology, it is possible to modify the geometry of biocompatible synthetic membrane to alter its porosity. By comparing dialyzers that are made of the same synthetic membrane but with different flux characteristics, it is possible to delineate the effect of removing larger molecules from the effect of dialyzer biocompatibility. In this study, we assessed effect of flux characteristics on the markers of inflammation, lipid metabolism, and arterial stiffness by comparing the result of two dialyzers that are composed of identical synthetic membrane but have different porosity. All patients who had ESRD and were admitted to the HD program at the Dialysis Unit of the Alice Ho Miu Ling Nethersole Hospital (Hong Kong, China) and the Prince of Wales Hospital (Hong Kong, China) were screened. Stable anuric maintenance HD patients who were on a dialyzer reuse program using low-flux polysulfone membrane (F6HPS; Fresenius Medical Care, Bad Homburg, Germany) and bicarbonate dialysate for ≥3 months and had satisfactory vascular access were included in the study. Patients who were older than 75 years; those with a history of active infection, inflammatory disease, ongoing malignancy, or active-phase immune disease; those who were administered immunosuppressive drugs; those with planned renal transplantation in the subsequent year; and those with baseline measured CRP level >50 mg/L were excluded. The protocol was approved by the Joint Chinese University of Hong Kong–New Territories East Clusters Clinical Research Ethics Committee. The study fully adheres to the Declaration of Helsinki, and all patients gave oral and written consent. The patients were randomly assigned to received 24 weeks of HD treatment with either high-flux polyamide membrane (Polyflux 14S; Dialysatoren GmbH and Co., Hechingen, Germany; group A) or low-flux polyamide membrane (Polyflux 6L; Dialysatoren GmbH and Co.; group B). Both dialyzers are made of identical material (Polyamide S). During the successive 24 weeks, the opposite method was used. Randomization was stratified to duration of dialysis and status of diabetes by drawing a consecutively numbered, sealed, opaque envelope that contained a form indicating which membrane was used first for the dialysis therapy. Before the study, the envelopes were numbered using a randomization table. For minimization of the effect of small-size molecule clearance on the study outcome (8), the urea clearance of Polyflux 14S and Polyflux 6L was similar and was comparable to that of the baseline polysulfone dialyzer (F6HPS). The performance and technical data of the dialyzers are summarized in Table 1. Apart from the dialyzers, all patients underwent dialysis with their usual prescriptions (blood flow, dialysate flow, dialysis treatment time, anticoagulation type, and dosage), and these prescriptions were kept unchanged during the 48-week study period. Dialyzers were processed for reuse using an automated system, and Puristeril 340 was used as the dual cleansing and sterilizing agent. Dialyzer was rejected from reuse when the dialyzer had been used for a total of six treatments, the number of fibers that were visually blocked by fibrin coagulation or other blood residues at the end of a HD treatment was judged to be too great to warrant a reprocessing treatment, and the total cell volume of the dialyzer after reprocessing was ≤80% of the initial level. The prescriptions of 3-hydroxy-3-methylglutaryl-CoA (HMG-CoA) reductase inhibitors (9), angiotensin-converting enzyme inhibitors (ACEIs) (10,11), and angiotensin II receptor antagonists (ARAs), if any, were not changed throughout the study period. Predialysis blood sample for serum high-sensitivity CRP (hs-CRP) was measured at weeks −1, 0, 11, 12, 23, 24, 35, 36, 47, and 48. Two sets of blood specimens in 2 consecutive weeks were required for possibility of significant intraindividual variation (12). Mean value of these two hs-CRP levels was used for data analysis. 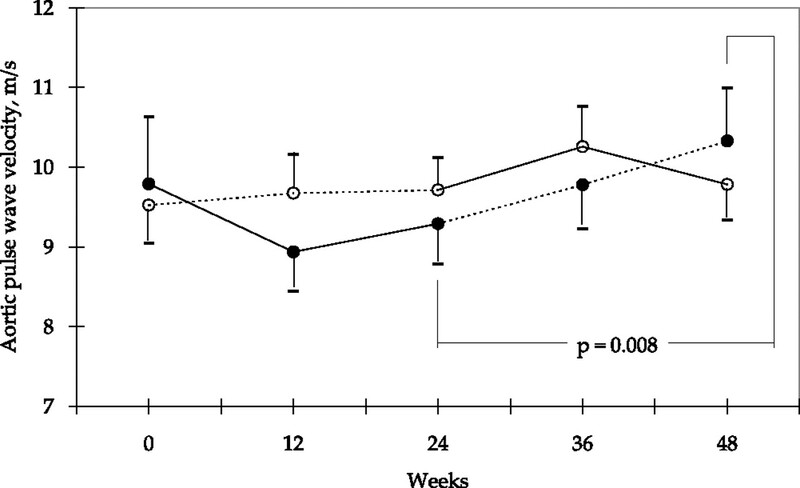 Predialysis blood sample for serum β2-microglobulin (β2M), fibrinogen, IL-6, triglyceride, LDL cholesterol, HDL cholesterol, and lipoprotein(a) were measured at weeks 0, 12, 24, 36, and 48. The intra-assay/interassay coefficients of variation for the hs-CRP, β2M, fibrinogen, IL-6, triglyceride, LDL cholesterol, HDL cholesterol, and lipoprotein(a) were 3.7/6.1, 3.7/5.1, 2.4/3.1, 6.6/8.7, 1.2/3.9, 0.7/2.8, 1.5/2.3, and 4.3%/5.4%, respectively. Single-pool Kt/V (spKt/V) value was estimated using Daugirdas second-generation equation at weeks 0, 12, 24, 36, and 48. To minimize effect of the length of interdialytic interval on the blood biochemistries (13), we sampled the specimens on designated treatment days in the week. Aortic pulse wave velocity (PWV), an index of aortic stiffness, was monitored at weeks 0, 12, 24, 36, and 48. It was measured using an automatic computerized recorder, and the results were analyzed using the Complior SP program (Artech Medical, Pantin, France). Pressure-sensitive transducers were placed over the neck (carotid artery) and groin (femoral artery) with the patient in the supine position on the day of HD treatment before putting the patient on the dialysis machine. PWV of the carotid-femoral territory was calculated by dividing the distance between the sensors by the time corresponding to the period separating the start of the rising phase of the carotid pulse wave and that of the femoral pulse waves. For elimination of effect of intraobserver variation, the test was performed by the same observer, who was blind to the flux characteristics choice of the dialyzer. It has been shown that the aortic PWV is independent of BP in patients with ESRD (14); the PWV data were not standardized by BP in this study. Inflammatory events were monitored during the study period. Patients would be out of the study if a significant change in clinical condition were expected to last for >4 weeks. If the inflammatory event was temporary, the ongoing study period would be prolonged so that, after recovery from the event, at least 4 weeks of stable condition had occurred before blood sampling and PWV measurement were performed. The primary end points were the differences in inflammatory indices, and the secondary end point was the progression of aortic stiffness as assessed by the carotid-femoral PWV between the two groups. Data from patients who failed to complete the 48-week study were excluded from the final analysis. A sample size of 32 patients was necessary to achieve 91% power to detect a difference in hs-CRP levels of 6 mg/L, with a two-tailed significance of 0.05 (15). With an expected dropout rate of 20% per year, a minimum of 40 patients were required. Statistical evaluations were performed by means of SPSS 13.0 software package (SPSS Inc., Chicago, IL). Unless otherwise specified, data are expressed as mean ± SD. The repeated measures ANOVA test was used to analyze the data intraindividually, and the unpaired t test was used for the analysis between the two groups tested at all time intervals. All reported P values are two-sided. P < 0.05 was considered statistical significant. Forty-six patients were recruited into the study; 22 patients were randomly assigned to group A, and 24 patients were assigned to group B (Figure 1). One patient in group A was withdrawn after his first treatment for a presumed reaction to the dialysis membrane. Two patients in group A died at week 43 (one after termination of dialysis because of exhausted vascular access, and the other because of acute myocardial infarction), and one patient in group B died at week 20 because of intracranial hemorrhage. Thus, the dropout rate was 8.7%, and 19 patients in group A and 23 patients in group B completed the 48-week study and were included in the final analysis. Baseline patient characteristics of the two groups were similar (Table 2). There was no difference in spKt/V values between the two groups in the study period (Table 3). 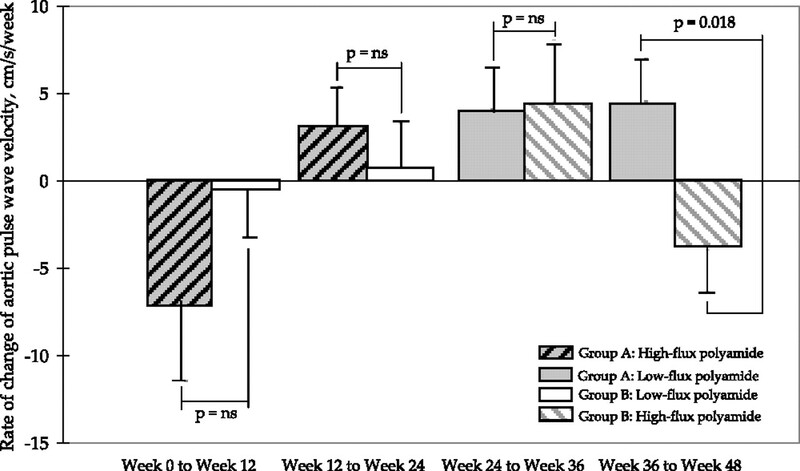 Predialysis serum β2M decreased significantly when using high-flux polyamide membrane (weeks 12 and 24 and weeks 36 and 48, groups A and B, respectively; Figure 2). There was no significant difference between the two groups in the predialysis serum albumin, hs-CRP, fibrinogen, IL-6, triglyceride, LDL cholesterol, HDL cholesterol, and lipoprotein(a) levels in the study period (Table 3). Predialysis β2M levels from baseline in two groups of patients using a crossover design. Treatment in group A (●) was started with high-flux polyamide membrane (Polyflux 14S; solid line); in group B (○), low-flux polyamide membrane (Polyflux 6L; dashed line) was used initially. *P < 0.0001 between groups. Data are means ± SEM. There was also no difference between the two groups in the aortic PWV at weeks 0, 12, 24, 36, and 48 (Figure 3). Within group A, there was a significant increase in aortic PWV after switching the high-flux polyamide membrane to its low-flux counterpart (week 24 versus week 48; P = 0.008; Figure 3). Moreover, in contrast to the low-flux polyamide group, the rate of change in aortic PWV decreased significantly in the high-flux polyamide membrane group from weeks 36 to 48 (P = 0.018; Figure 4). Aortic PWV from baseline in two groups of patients using a crossover design. Treatment in group A (●) was started with high-flux polyamide membrane (Polyflux 14S; solid line); in group B (○), low-flux polyamide membrane (Polyflux 6L; dashed line) was used initially. Data are means ± SEM. Rate of change of aortic PWV in the study period. Data are means ± SEM. In an attempt to assess whether baseline membrane modified impact of high-flux dialysis on the arterial stiffness, we compared the changes in aortic PWV values in group A from week 0 to week 24 (baseline membrane was low-flux polysulfone) with that in group B from week 24 to week 48 (baseline membrane was low-flux polyamide). As shown in Figure 5, use of high-flux polyamide membrane was associated with a significant decrease in rate of change in aortic PWV for patients who were previously on low-flux polysulfone membrane (P = 0.042). Impact of the baseline dialyzer on the effect of high-flux dialysis on the rate of change of aortic PWV. Data are means ± SEM. The primary aim of this randomized, crossover study was to assess the effect of membrane flux characteristic on selective parameters of inflammatory indices, lipid metabolism, and arterial stiffness. To separate effects of biocompatibility and flux, we studied membranes that were made of the same synthetic material but had different flux characteristics. The latter is brought by an alternation in the dialyzer design and geometry. Studies suggested that such modification did not affect the biocompatibility profile of the membrane (16,17). In this study, low-flux polyamide blend (Polyflux 6L) and high-flux polyamide blend (Polyflux 14S) were compared. According to data from the manufacturer, both dialyzers have nearly identical characteristics on small-sized molecule clearance (Table 1). The latter was supported by the comparable Kt/V values between the two groups in the study period. Moreover, only anuric patients were recruited; therefore, any observed differences could be readily attributed to the higher clearances of larger molecules by the high-flux membrane. Finally, other factors that may affect the inflammatory indices, lipid metabolism, and arterial stiffness, including prescriptions of HMG-CoA reductase inhibitors (9), ACEIs (10,11), and ARAs, were also controlled. As expected, our results suggest that the use of the high-flux polyamide membranes were associated with a significant decrease (up to 31% from baseline) in the predialysis serum β2M levels; however no difference between membranes was observed for the markers of systemic inflammation (serum hs-CRP, fibrinogen, and IL-6) and lipid metabolism [serum triglyceride, LDL cholesterol, HDL cholesterol, and lipoprotein(a)]. Similar findings were noted between our study and three other prospective, randomized trials of similar study design. These studies compared polysulfone membranes with different flux characteristics and showed no differences in hs-CRP (5,6), IL-6 (5), lipoprotein(a), and lipid profiles (5,7) between the groups. Aortic PWV is an index of aortic stiffness that has been shown to predict all-cause and cardiovascular mortality in HD patients (18). An increase in aortic PWV indicates an increase in aortic stiffness. It has been demonstrated that each aortic PWV increase of 1 m/s is associated with a 39% increase in all-cause mortality (18). Our data suggest that the rate of change in aortic PWV was significantly decreased with use of the high-flux polyamide membrane (weeks 36 to 48), and the aortic PWV was significantly increased after switching from high-flux to low-flux polyamide membrane (group A, weeks 24 to 48). All of these data support a favorable effect of high-flux polyamide membrane on aortic stiffness. To the best of our knowledge, only one published study assessed effect of larger molecule removal on aortic PWV. That 1-year randomized trial showed no difference in the aortic PWV between low-flux HD and online hemofiltration (19). The reason for the discrepant result between their study and this one is not clear; however, a direct comparison between these two studies may be difficult. Apart from higher baseline aortic PWV values suggesting more advance aortic stiffness, their patients had shorter duration of dialysis (2.8 versus 7.2 years). In this regard, it should be noted that the HEMO Study suggested that the duration of dialysis might modify the beneficial effect of high-flux dialysis (4). Finally, it has to be emphasized that not all studies on convective-based dialysis therapy quantify larger molecule removal and an adequate target on removal of these molecules is lacking as well. Without such a quantification or target, it is practically difficult to compare results of these studies. A similar finding on the interaction between aortic PWV and high-flux dialysis was not observed in the initial phase of the study (weeks 0 to 24). Assuming that the interaction was real, the inconsistency of the finding may be attributed to the different baseline low-flux membranes before the high-flux dialysis with polyamide membrane. This is supported by our findings that, in contrast to patients who were switched from low-flux polyamide membrane (group B, weeks 24 to 48), patients who were initially put on low-flux polysulfone membrane (group A, weeks 0 to 24) were found to have a significant decrease in the rate of change of aortic PWV after the use of high-flux polyamide membrane. The lack of equivalence in arterial stiffness between polysulfone and polyamide membranes is further supported by the finding by Mourad et al. (20) that the use of a low-flux polysulfone membrane was associated with a significant increase in aortic PWV during dialysis when compared with the use of a high-flux polyamide membrane. There are several limitations to this study. First, despite that patient recruitment satisfies the sample size estimation, the sample size may be inadequate to detect a difference in the aortic PWV value between the groups. On the basis of these data, we calculated that 296 patients were necessary in each arm to have 90% power to detect a difference of 0.5 m/s in aortic PWV, with an SD value of 2.0 m/s and a significance level of 0.05 (two-tailed) (21). Second, the cohort of the study was heterogeneous and the inflammatory biomarkers and lipid profiles may be affected by other factors. In this regard, there were no differences in the results obtained by subgroup analysis comparing patients with and without baseline HMG-CoA reductase inhibitor treatment, with and without baseline ACEI/ARA treatment, high and low baseline standard Kt/V values, and high and low baseline hs-CRP values. Finally, the follow-up period may be too short to detect changes in aortic PWV. Our findings suggest that HD with a high-flux polyamide membrane effectively decreased the predialysis β2M level. It seems that the same synthetic membrane but with different flux characteristics did not modify the biomarkers of inflammation and lipid profile in these stable anuric HD patients; however, significant worsening of aortic PWV was noted for patients who switched from high-flux to low-flux polyamide membranes, and a significant decrease in rate of change in aortic PWV was found with the use of high-flux polyamide membrane. All of these data suggest a beneficial effect on aortic stiffness for patients who are maintained on high-flux polyamide membranes. Further studies to recruit more patients and with a longer observation period may be needed to confirm the favorable effects of high-flux polyamide membrane on arterial wall stiffness. The high-flux polyamide membrane (Polyflux 14S) dialyzers used in the study were supplied by Gambro. The authors would like to thank Dr. Frederique Moureau for her contributions in the planning of the study.